Date Scones | May You Cook It! A scone is a British type of quick bread originating from Scotland. It was originally made in a round, flat form and baked in a griddle. After baking, it was divided into triangle quadrants. The whole, flat bread is called a bannock and the triangle segments called scones. * The introduction of baking powder to commercial and household kitchens led to the scone’s development into the leavened, oven-baked version commonly seen today. Scones are popular in the UK, New Zealand, Australia and other countries in the Commonwealth. Mix the flour and sugar together. Rub the butter into the mixture using your fingertips. Continue until you achieve the consistency of breadcrumbs. Add the milk and dates. Mix with a spatula using a cutting motion until the mixture begins to hold. The dough should become soft and a little sticky. Transfer the dough onto a floured surface and knead gently for about 4 mins. 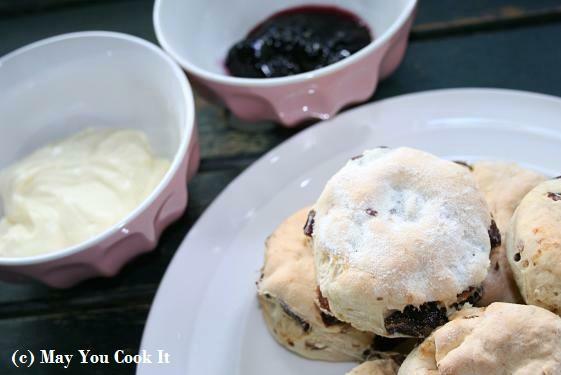 (Do not over handle the dough as this will cause your scones to become tough and heavy). Place onto a greased sheet tray, spaced about 1 cm apart. Bake for about 15-20 mins until golden. 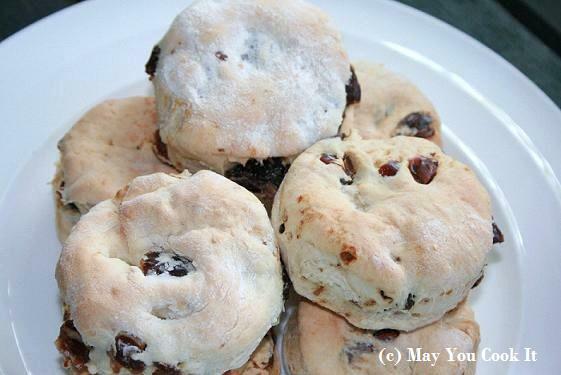 This entry was posted in Breads and tagged breads, date scones, scones, tea on April 24, 2011 by m.